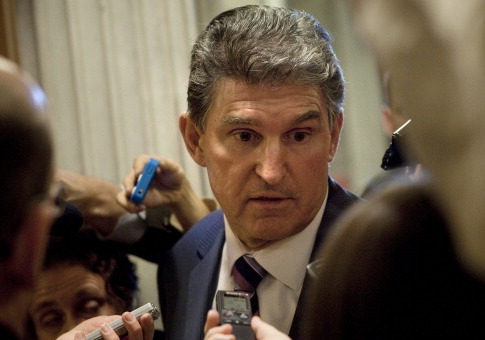 Potential 2020 presidential candidates are targeting Sen. Joe Manchin (D., W.Va.), saying he should not be named the senior Democratic member on the Senate Energy and Natural Resources Committee. Democratic Gov. Jay Inslee (Wash.) circulated an email on Tuesday evening praising Manchin for being a "champion" for affordable health care, but he said the West Virginia senator is "simply wrong" on climate, the Daily Beast reported. "Look, Joe Manchin has been a champion for affordable health care for every American. He's been a leader on issues you and I care deeply about. But on climate, he's simply wrong," Inslee wrote. Liberal billionaire and environmental activist Tom Steyer echoed Inslee's sentiment, telling the Daily Beast that the West Virginia Democrat does not "offer a bold, positive path forward" on climate and environmental issues. "Every American has the right to clean air and clean water, and it’s time for those in Washington, D.C. to stop playing politics and to take real action on climate," Steyer said. "Democrats must offer a bold, positive path forward— but Senator Manchin does not offer that vision and should not be the Democratic leader on the Senate Energy and Natural Resources Committee. Senate Democrats owe it to their constituents to tell the truth, acknowledge the urgent climate crisis we’re in, and do what’s right—instead of what’s politically expedient for them." It is rare for the most powerful minority party position on a Senate committee to become the center of a national litmus test, but Manchin's environmental policies clash with the environmental agenda of many progressive Democrats, according to the Daily Beast. The senator famously shot a copy of cap-and-trade legislation with a shotgun in a TV ad for his first run for the Senate in 2012. He recently voted for the confirmation of David Bernhardt, a lobbyist for the oil-and-gas and agribusiness industries, to be second-in-command at the Department of the Interior. And the influence of the coal industry in his state has prompted concern that he would stand in the way of progressive-minded reform should Democrats ever take back the majority in the Senate and he end up as chair of the energy committee, which will play a potentially vital role in working on climate change legislation. Manchin’s office declined to comment for this piece. But the 2020 implications don’t end there. One way Manchin could be boxed out of the ranking member spot on the energy committee would be if Sen. Bernie Sanders (I-VT) decides he wanted it instead. According to the Democratic Party’s seniority rules, Sanders is in line for the post before Manchin. And the Vermonter has made advocacy for environmental reforms a key component of his political appeal. While Sanders has been vocal about environmental issues, he appears to be more focused on remaining on the Senate Budget Committee as ranking member rather than switching to the energy committee. Some who have worked with Sanders noted there are multiple reasons he might be hesitant to take on the other ranking member gig, one reason being the budget committee provides a platform for him to be associated with multiple issues rather than just one. They say it could also be difficult for him to juggle the energy committee’s demands with a presidential run, should he choose to run again. "I cannot imagine that were he to run again, that he would in any way abandon his Senate responsibilities which he takes seriously," said Mark Longabaugh, a senior adviser on the 2016 campaign. The Daily Beast said Senate aides would not comment on what types of pressure Manchin and Sanders were facing from leadership behind the scenes, but Lukas Ross, senior policy analyst at Friends of the Earth, insisted Senate Minority Leader Chuck Schumer (D., N.Y.) fix the issue. "There are only two politically salient facts," Ross said. "Joe Manchin is categorically unacceptable. The second is that Chuck Schumer can absolutely fix this." This entry was posted in Politics and tagged 2020 Election, Chuck Schumer, Climate Change, Joe Manchin, Tom Steyer. Bookmark the permalink.